With its capital city of Dakar located on the westernmost point of Africa, Senegal is a gateway to the African continent. The land of “Teranga” (hospitality) has some of the best transportation and telecommunications infrastructure in West Africa. Dakar has become the transportation hub of the West Africa region, with numerous airlines flying eastbound towards other African countries and northbound to Northern Africa, Europe and the United States. The Port of Dakar is the first major port-of- call from Europe and America, and is well served by major shipping lines. The port also serves as an entrepot transshipment center for landlocked nations in West Africa, enabling fairly easy access to these different markets. Today, many companies use Senegal as a regional base for their West Africa operations. Since independence from France in 1960, Senegal has been a functioning democracy. Free and fair elections in 2000 brought H.E. President Abdoulaye Wade to power, ending 40 years of Socialist Party rule. He was re-elected in 2007. Senegal is a country characterised by a diverse mix of cultures and ethnicities blending together peacefully, which has helped build the country’s international reputation for hospitality and stability. Senegal’s voice is both heard and respected in organisations such as the Economic Community of West African States (ECOWAS), African Union (AU) and United Nations (UN). After two years marked by the effects of the global financial crisis, the Senegalese economy began to recover in 2010 thanks to the global economic recovery and measures taken by the authorities to boost national economicactivity. Gross Domestic Product (GDP) was estimated to have grown from 2.2% in 2009 to 4.2% in 2010, and is projected to reach 4.5% in 2011. This will be largely due to the performance of the three sectors of the economy – primary, secondary and tertiary – which accounted for 14.7%, 20.4% and 64.9% respectively of the GDP in 2010. 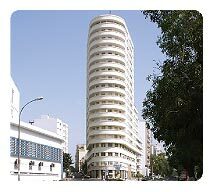 Underscoring the priority placed by the Senegal authorities on attracting foreign investment, the Government created the Investment Promotion Agency (APIX S.A.) in 2000 and the Presidential Council on Investment in 2003. To further boost the economy and facilitate exports to the West African region and its 270-million-strong consumer market, the Government is investing heavily in large-scale infrastructure projects such as a new international airport, toll highway, special economic zone as well as the modernisation and expansion of the Port of Dakar. The Senegalese are generally well disposed towards foreigners, and actively seek business partners from emerging countries. France remains Senegal’s largest economic partner, with China, India, UAE and Iran counting among the country’s main trade and investment partners. Other major foreign investors include the USA, Switzerland, Germany, Japan, South Korea, China, Taiwan, India, Iran, Morocco, Dubai, Sudan and Nigeria. 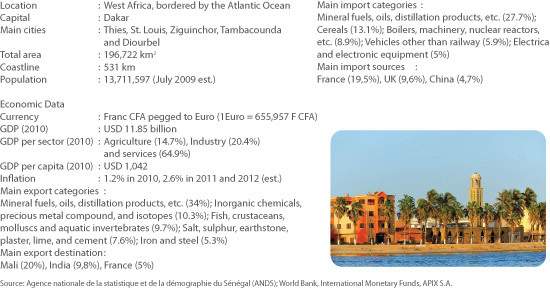 The main sectors attracting foreign investment in Senegal are in chemical processing (phosphates), petroleum refining, food processing, seafood products and processing industries, information and communication technology as well as the textile and garment industries. As Senegal begins to realise its potential, the country’s reforms in recent years have also attracted more and more investors. In fact, Senegal was Africa’s leading reformer among the top 10 reformers in doing business 2009. The Government’s priority action plan for economic transformation (2011 – 2015) covers key sectors such as energy, road infrastructure (interior and regional linkages), agriculture and social sectors (education, health and low cost housing). 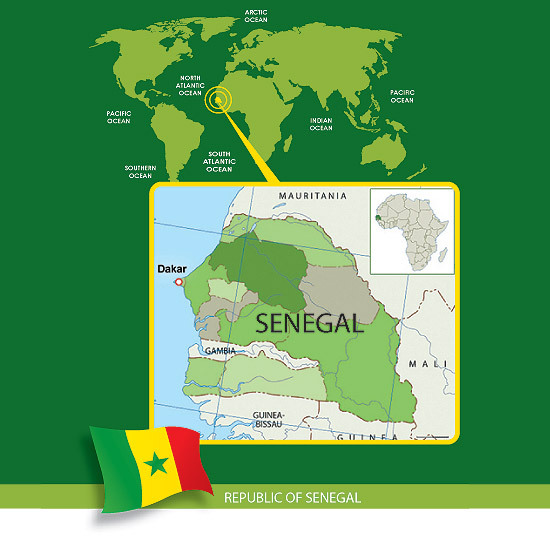 As a primary trading hub in West Africa, Senegal offers a wide range of business opportunities to Malaysian companies seeking to venture and develop their operations in the region. Senegal and Malaysia have signed a bilateral agreement on investment protection. Investment and PPP opportunities exist in power generation, real estate (low cost, middle and high end market), construction (roads, bridges), tourism resorts, agriculture and agro-industries, fish canning, telecommunications, call centres and shared services outsourcing, bus and passenger car assembly as well as the textile and garment industries. Trade opportunities for Malaysian companies exist in telecommunication equipment, power generation systems, construction equipment, medical equipment, wastewater treatment technology, agricultural equipment, computers and peripherals, food processing machinery and building materials.